IMVU Password Decryptor is a free desktop tool to instantly decode and recover IMVU messenger password. IMVU is a popular 3D based social gaming messenger used by millions of people around the world. Like any other messenger, it stores the password locally so that user don't have to enter the password every time. 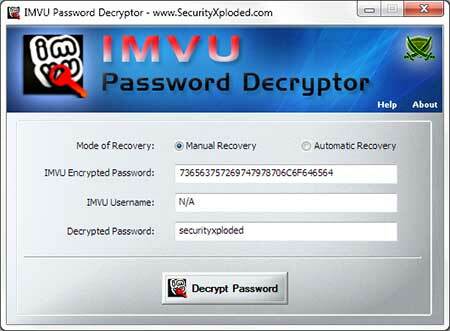 IMVU Password Decryptor helps you to easily & automatically recover this saved password by IMVU. It supports dual mode of password recovery, Manual & Automatic. In 'Manual Mode' you can directly enter the encrypted IMVU Password taken from local or any other system. In 'Automatic Mode' it will find the stored IMVU username & password on your local system and displays the decrypted password. IMVU Password Decryptor works on both 32-bit & 64-bit systems starting from Windows XP to Windows 10. Supports direct password decryption as well as automatic recovery from local system. Integrated installer for local installation & un-installation. IMVU Messenger stores the login username & password at below mentioned Registry location respectively. IMVU Password Decryptor comes with Installer to help in local installation & un-installation. This installer has intuitive wizard which guides you through series of steps in completion of installation. Run 'IMVU Password Decryptor' on your system after installation. You can also enter the encrypted IMVU password from another system and get it decrypted instantly. Screenshot 2: Showing the automatically recovered IMVU Username & Password from the local system. 'IMVU Password Decryptor ' is designed with good intention to recover the Lost IMVU Password. Like any other tool its use either good or bad, depends upon the user who uses it. However neither author nor SecurityXploded is in anyway responsible for damages or impact caused due to misuse of IMVU Password Decryptor. Major 2017 edition with support for recovering passwords from IMVU Messenger on Windows 10. Also includes new Installer. SNew feature added to Installer to dynamically download latest version. Support for automatically copying the decrypted IMVU password to clipboard. Integrated installer for local installation & un-installation. Added button to quickly copy the decrypted IMVU password. First public release of IMVU Password Decryptor.